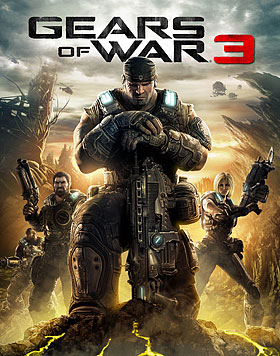 As promised, Microsoft has aired the first single-player campaign trailer for Gears of War 3. It aired, as expected, at the end of the Champions League final between Barcelona and Manchester United (won by Barcelona). This first full trailer opens by basically re-hashing the earlier released teaser trailer featuring protagonist Marcus Fenix and his father Adam. The new trailer goes on to show action between COG (Coalition of Ordered Governments) and Locust forces, as well as the new enemy variant, the Lambent (mutated members of the Locust). In addition to the new enemy, for the first time in the series, Gears of War multiplayer will feature four-player co-op gameplay. Gears of War 3 will be the final game in the current story arc. Pre-orders are available here. The game will be shipped in Standard, Epic, and Limited editions, and ships on Sept. 20th.